Like many Scottish distillery names, the somewhat unpronounceable Auchroisk, once translated from Gaelic to English ends up being a relatively simple descriptor of the physical place where it resides. Sure, this simplicity can occasionally seem a little obvious and uncreative on the part of the original namers, but when it comes right down to it, it’s a lot more evocative than calling it, say, “Diageo Blend Supplier Plant #3. In Auchroisk’s case, the name translates roughly to “the ford across the red stream”, A ford, of course, being a shallow place in a river used to cross it and not a car lying across a river, although seeing a 1959 2-door hard-top Galaxie lying across a river would really be something. The aforementioned stream is the nearby Mulben Burn from which Auchroisk takes its process water (water used to cool the spirit condensers and for cleaning the facility). The distillery turns to another source, Dorie’s Well, for its production water, which is the h2o actually used directly to make the whisky. Auchroisk (pronounced Auck-Roysk…or Ack-Rask…or Ath-Rask, depending) is rarely released by its owners, Diageo, as an official distillery bottling, it is a main component of the J&B blend, and therefore doesn’t get to see much light of day on its own. 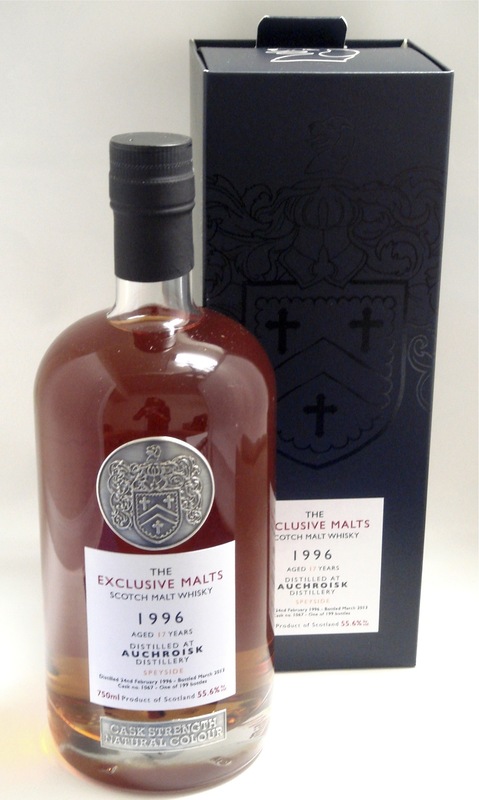 Luckily, there are a fair number of independent bottlings released, such as this one from the Creative Whisky Company’s Exclusive Malts range. The Exclusive Malts made their way to the US for the first time in the Spring of 2013. This refill American Oak-matured expression is part of the second wave to hit these shores. The Nose: A sweet and spicy nose. Big notes of lemon meringue including that caramelized top, along with brown sugar and butter on hot oatmeal. There’s also vanilla custard, orange marmalade, and lesser notes of butterscotch. Quite a bit of sanded oak with just a touch of fresh-cut pine along with dusty cinnamon and dried green grass. Adding water tones down the sweetness some while coaxing out much brighter, livelier spice notes of hot cinnamon, ginger, and orange peel. Water also adds a bit more sweetened malt, and a subtle hint of dried flowers and grass. The Palate: Wonderful oily mouthfeel with continued brown sugar/caramel sweetness from the nose. A big, juicy, citrus hit of spiced orange leads quickly into an increasingly powerful, darn near over-the-top woody swell. More sanded oak along now with wet wood, slightly bitter baking spice, and unsweetened chocolate. Luckily the early sweetness lingers to balance this pleasant but sharp, almost green woodspice. Water is really a welcome addition here and tones down that wave of wood. Still quite tannic and spicy towards the end, now with a bit of clove, the preceding citrus sweetness is drawn out and joined by more toasty, chocolatey, malty notes. The Finish: Lengthy with more tannic, though slightly bitter woodspice, and just enough burnt sugar to keep that sweetness rolling. Water again helps to quiet those wood notes. Thoughts: Interesting and fairly delicious stuff. At strength, there’s a subtle complexity that manages to come through despite being nearly overshadowed by the vigorous wood and spice notes. That, along with the high ABV makes it a little tough really enjoy at strength, but with water, this one becomes a lot more special. More complexity is allowed to come through on the nose and the palate definitely benefits with more layers emerging from behind all that oak – the chocolate and malts notes are especially nice. Rich yet rugged, this would be a lively after-dinner whisky. Recommended.